Bluetooth, Rear View Camera, Premium Audio, Heated Seats, Air Conditioning! Compare at $23427 - Our Price is just $22745! Exceptional efficiency and peppy performance make this 2018 Honda Civic Sedan as fun to drive as it is to look at. 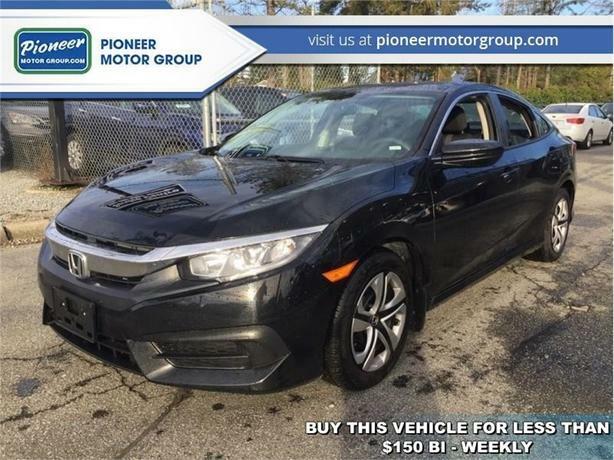 This 2018 Honda Civic Sedan is fresh on our lot in Maple Ridge. The Honda Civic Sedan has come a long way and it keeps getting better. It's no wonder it's one of Canada's best selling cars. The stunning exterior and impressive performance of this 2018 Civic are clear examples of its exciting evolution. Its progressive look is perfectly complemented by a sophisticated interior designed with your comfort and safety in mind. If you're looking for greatness, this Honda Civic Sedan has a seat for you. This sedan has 28764 kms. It's black in colour. It has a cvt transmission and is powered by a 158HP 2.0L 4 Cylinder Engine. This vehicle has been upgraded with the following features: Bluetooth, Rear View Camera, Premium Audio, Heated Seats, Air Conditioning. It has some remaining factory warranty for added peace of mind. Our Civic Sedan's trim level is LX CVT. Moving up to the LX model of the base DX is a great choice as you'll receive 16 inch wheels, an upgraded 7 inch colour display screen with integrated rear view camera and a premium audio system, bluetooth streaming audio and heated front seats. You'll also receive air conditioning, cruise control, remote keyless entry, power windows, VSA electronic stability control and a 60/40 split rear seat plus much more. Buy this vehicle now for the lowest bi-weekly payment of $148.19 with $0 down for 84 months @ 4.99% APR O.A.C. ( Plus applicable taxes - Plus applicable fees ). See dealer for details.